Indexes gained 1% on a day when the Federal Reserve began deliberating its first interest rate hike in almost a decade. The Federal Reserve began its two-day monetary policy meeting; after which it is likely to announce an interest rate hike for the first time in nine years. While an increase is widely expected, investors will be carefully reading the Fed's Wednesday statement for clues on the expected pace of interest rate upticks in the coming years. As for individual stocks, Dow giant 3M (NYSE:MMM) and flooring retailer Lumber Liquidators (NYSE:LL) both saw large price swings today. 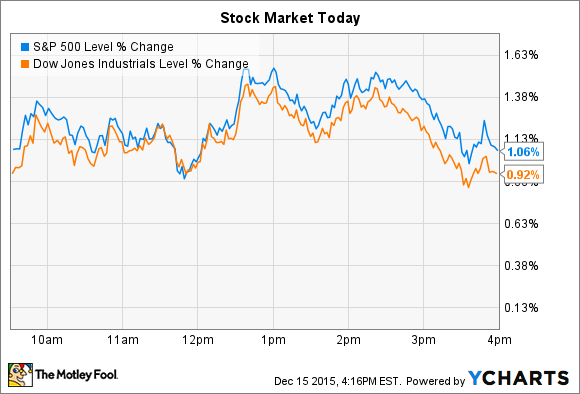 With its 6% drop today, 3M suffered the biggest percentage-point decline of stocks in the Dow or the S&P 500. Investors punished shares after the consumer and industrial products company lowered its sales and earnings outlook for the second time in two months. At an investor conference, management said that they now see organic growth for full-year 2015 coming in at 1%, compared to the 1.5% to 2% range they had set with their third-quarter earnings release on Oct. 22. Prior to that, in July, the range had been forecast at between 2.5% and 4% organic growth . Citing the "realities of a continued slow-growth global economy," Chief Financial Officer Nicholas Gangestad also lowered his team's projected profit outlook. Earnings should now ring in at $7.55 per share this year, down from the $7.63 per share that 3M had forecast less than two months ago. Again, that prior forecast was lowered from a July target of $7.83 per share. 3M issued conservative guidance for the year ahead, calling for organic growth of 2% and EPS gains of 11%. While the profit boost, aided by cost cuts and significant stock repurchases, is within management's long-term earnings growth goal, the organic sales projection isn't. 3M targets annual growth of between 4% and 6% and managed 5% growth in 2014. But with today's update, the company is on track to post two straight years of significantly lower sales growth. 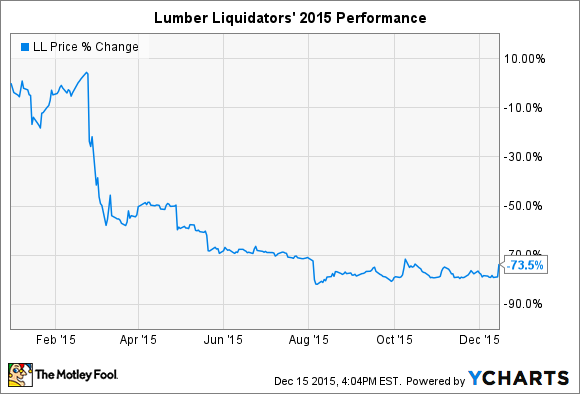 Hardwood flooring retailer Lumber Liquidators spiked 25% higher today on nearly ten times its normal trading volume. Yet even with the bounce shares remain deeply in the red: The stock is down 73%, year-to-date. Today's rally coincided with the public exit of a high-profile short seller. Hedge fund manager Witney Tilson announced in a blog post that he has covered his short position (meaning he removed his bets against the company) after deciding that the bearish stance was no longer "attractive." "The downside scenarios for the company (and the stock) are less likely and the upside (recovery) scenarios are more likely," Tilson said, and, "this shift in the risk/reward equation has led me to cover my short position." As it didn't include new information around Lumber Liquidators' issues with government regulators and consumer groups regarding the safety of certain of its China-imported products, Tilson's announcement alone shouldn't sway investors to either buy or sell the stock. The exit of a major short seller, even one with as high a profile as his, won't make any difference to the stock's long-term trajectory. If Lumber Liquidators is going to recover, it will have to get back on a path to profitability – and that starts with finding a way to convince shoppers to return to its 400 locations. Comparable-store sales declined 15% in the third quarter, despite price cuts that pushed gross margin down to 30% of sales from 39% a year ago. CEO Thomas Sullivan and his executive team will need to post better results than that for today's spike to contribute to a sustained rebound.